We Canceled My Wife's Life InsuranceEliminate The Muda! We have two young children, college is not fully covered, yet, we have a mortgage hanging on our shoulders but we canceled my wife’s life insurance. For some personal finance fanatics this will cause a heart attack. All financial planners have life insurance mapped somewhere in their plans and so do we. But thanks to an extra life management technique that few use, we found redundancy in my wife’s life insurance! First, a little about the technique; years ago I took a traveling job that allowed my wife to stay at home with the kids and with administrative responsibility of the household. Before long I had become disconnected with our financial situation. I had no idea what accounts we had or whom all we owed. To address this, my wife made a “financial cheat sheet.” A listing of every debtor, bank account or routine bill, complete with account number and contact info… “just in case.” It was a great idea and a list we planned on updating annually. Until recently, I thought we were the only ones that did this, but Patrick at CashMoneyLife calls his list a Financial Inventory. Patrick however takes his list a little further including contacts of close family, friends, attorneys and even list his business contacts, accounts and information. This additional information made great sense; I was compelled to update our cheat sheet. While reviewing our list however a red flag was raised. We had two listings for my Wife’s term life insurance policies. One policy was purchased several years ago when the kids were young. She never hesitated to pay the annual premium; it had become routine. Because this original policy was so routine and so old we even forgot how much this policy was for. This article was featured in the Festival of Frugality hosted by Sweating the Big Stuff. Please check out this festival for many other great articles about personal finance. Then, almost two years ago, now in a much better financial condition, we decided to increase our insurance coverage. We purchased a new policy for me in addition to the coverage I have through my employer. We also purchased a new policy my wife. So here we were with two listings for my wife along with account number and contact information but not the coverage value. Making a couple calls and filling out a few forms we learned the older policy was actually for $100K, the newer policy was for $250,000. Taking it one more step we found that the costs for each policy were relatively similar at a little over $100/$100K/year. Insurance is a prudent investment, but in our position we simply don’t need that much. $350,000 is overkill. The smaller policy was canceled. Taking the time to document all of our financial relationships on one page was originally “just in case.” As it turns out, the few minutes we spend will save us a lot of money. Create your own financial cheat sheet, for the benefit of those that may have to address your finances in your absence and to provide yourself witha little more clarity on your expenses or needs. 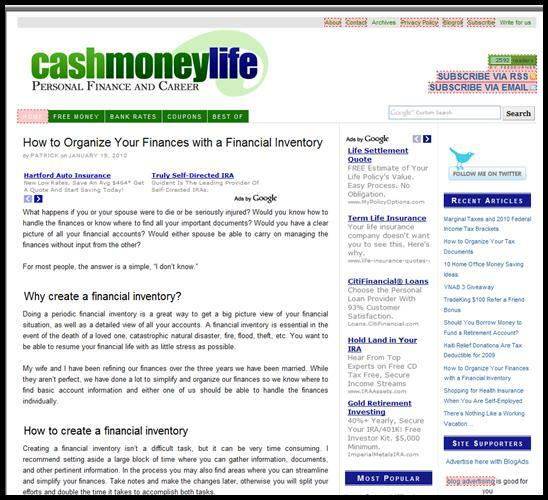 If you would like to get an idea of what to include, check out this post by Patrick at CashMoneyLife: How To Organize Your Finances with a Financial Inventory. I have no idea about your health or family situation, but did you think about all that when you went out of your way to save $20/month? That extra $100K could have purchased another 6 months of not working…it could have sent your 2 kids to college…it could have done a lot of things, but you saved $20/month (actually it is probably less than that). I am, by no means necessary judging, it just seems like there were probably other ways in your life to save $20…like 2 lunches made at home (which you may do already). .-= Evan´s last blog ..Is there Anything More Important than Money when it comes to a Job? =-. I have to say that this is one of the best ideas. My dad knew what accounts he had and where the policy/account numbers were but he never wrote anything down. We he became unexpectedly ill with a brain tumor last year he could no long remember what he had and where he kept it. He was only 50 an didn’t expect to die so young but it happened and I’ve had trouble locating all of his accounts and figuring out which policy covered what. I would also suggest having a power of attorney on file with each company you have any account with whether it’s life insurance or a checking account that you’re not on. Banks and probably other companies verify a power of attorney and this can take some time. If something happens and you don’t have anything on file with them it can make things difficult. It’s bad enough to lose someone you love but it’s even worse when you have to deal with an outdated will and try and figure out what companies the person has policies. Sorry for a morbid comment but this experience has taught me that we all need to be prepared because no one knows what is going to happen and we don’t want our loved ones to suffer even more because we weren’t prepared. Great Advice…since my own financial reinvention started, I have found numerous small items I had operating in redundence. Is that a word? Now I am going to log into my employer benefits site and make sure all of that is straight as well. .-= Tracy´s last blog ..New Car or Used Car: Eco-Friendly Or Not? =-. Interesting! I’ve been thinking about cancelling my Income Protection (or disability) insurance since it costs me around $500/year and the likelihood is pretty small. It’s probably a little redundant if combined with the life insurance as well. Just curious though, if it only costs you $100/year for a $100k cover, why did you cancel it? The thing that is very likely to happen is your wife and you are going to live for another 40 years so that’s around $4000-$6000 (including inflation) cost for $100k cover (if we’re talking cold math here). I tend to pay extra $10-20 in my car insurance so they increase the cover value by $1000-2000. In that case, I think it’s cheaper to invest in that extra $10 because who knows what sort of extra cost involved in losing a car. The same goes with my home insurance. Anyway, I tend to be overly cautious which might have cost me some money. @Kim – I am very sorry to hear that you lost your father at such a young age. You’re comments are not morbid. Your experiences are part of life and you willingness to share will help improve the decisions that others make. Thank you so much! @Evan – We already apply many other techniques to save wherever we can. It’s actually more like $10/month. The policy we kept will cover well over 100% of all our debt and likely provide more than enough to cover college for the kids as well. We really don’t have the need. If I were to pass away, it’s another story and why we have a substantially larger amount of insurance coverage on my life. @Tracy – Somehow things have gotten way too complicated. As we experienced it’s easy to lose control and end up over-paying unnecessarily. @Bytta – My wife is a stay-at-home Mom and has the most important job in our family. She is irreplaceable! From a financial perspective however, now that our kids are entering their teens, I simply don’t need much. As mentioned above the policy we kept would be plenty to address our needs with money to spare. Doesn’t sound like a bad idea to me. The policy is for your wife who is a stay-at-home mom, and your kids go to school all day, right? So the policy doesn’t have to replace her income or cover the cost of child care in the event of her passing, unless you opt for some after school program. If you were to become a widower you might need additional help around the house, you’ll probably eat out more often, and incur a myriad of other small charges as a result of her not being around to help you but that shouldn’t be much more $25k, do you think? And $250k/$25k/yr = 10 years. @David – This detail is starting to get a little weird personally because I obviously don’t like the thought about losing my best friend and wife. But looking at the possibility from a purely academic perspective there is also the offset of significantly lower costs with the loss of my wife. Our families expenses for food/clothing/medical etc.. would all go down. As long as my income remains similar there are no concerns. Even if it were to fall we also have additional financial reserves. The only potential deal-breaker is catastrophic medical issues. I’m not sure anyone has figured out how to address that! I saw Matt Lesko last night say 50% of bankruptcies are due to medical and of those 70% have health insurance! Agree with Evan on this one. Insurance is a tricky beast because you don’t want to be “caught with your pants down” but how much is enough? Life insurance is slightly more predictable than auto/health, so it wasn’t like you gambled more an educated assessment. The same practice can be translated to other investments as well. How many different funds do people have at different brokers. How many people have looked through their prospectus’ at the top 10 holdings. I agree with you on this one! One less bill to pay! Plus $250,000 sounds like a good safety net. I increased my insurance coverage too this year, but I still need to get coverage from a company separate from my employer’s insurance company. .-= [email protected]´s last blog ..Going With Paperless Statements, My Struggles Letting Go =-. @FinEngr – Great points on overlap especially with investment. I’m no expert there but I find it interesting when a person has several “index” funds that have lots of overlap. Last year I took close look at Targeted day funds and found extreme examples of this! @Don-Thanks for stopping in! “One less bill” is the best part and the only thing that makes sense considering the insurance retained is sufficient for our needs. Easy solution for LeanLifeCoach, complete a life insurance evaluator. Find out EXACTLY how much life insurance each of you needs, drop anything extra. Also, consider a family protection type policy, something that covers husband & wife under one policy. Generally all shared children will be included for no cost. Also, make sure you aren’t being penny wise and pound foolish. It’s great your saving where you can, but are your savings allocated in a way that allows you to manage risk and return properly? You mentioned you had significant assets saved up – make sure you give them plenty of thought as well. Great Post and cool website. Mine should be up next week.